Jack underwent genetic testing to investigate the cause of his diabetes which indicated a mutation in the KCNJ11 gene, a gene important for regulating insulin secretion, confirming a diagnosis of KCNJ11 neonatal diabetes. 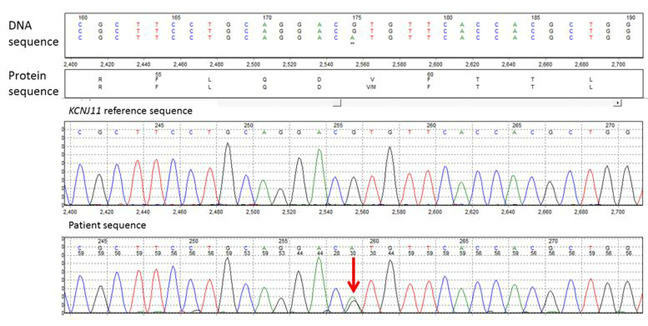 The DNA sequence result generated by the Genetics Laboratory is shown below and in Week 3 we will learn more about this. All patients with diabetes diagnosed at less than six months of age (whatever their age now) should be referred for genetic testing as they are highly likely to have a monogenic cause of their diabetes. You can find out how to access free genetic testing for patients with neonatal diabetes anywhere in the world on our Diabetes Genes website.